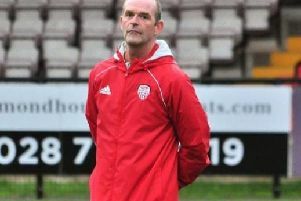 Institute boss Kevin Deery wasn't a happy man after their Irish Cup exit on Saturday. Institute manager Kevin Deery was fuming after their Tennent’s Irish Cup exit at Sport & Leisure Swifts, on Saturday. However Deery wasn’t too disappointed about his player’s efforts, but was very annoyed by referee Ross Dunlop and his assistant’s display throughout the 120 minutes. Despite the Carrickfergus official awarding his side three penalties, last season’s Irish Cup final referee sent-off Garbhan Friel and the unfortunate Ciaron Harkin, much to Deery’s frustration and the Stute gaffer was also annoyed at the state of the terrible Glen Road Heights pitch. “Firstly I don’t want to say too much, but the standard of officiating would leave you going crazy,” he said. “Look we are trying to improve the standard of football in this country, well that’s why I’m in the game for trying to improve players and ask them to do the right thing and play the right way, but how that pitch was passed playable was crazy. “The ball wouldn’t travel up the left hand side so I don’t know how it was passed. “Garbhan’s was a mistimed tackle on a bad pitch and yes he caught him a bit high so I could see why he was sent-off, but Gareth Brown was through one on one and was brought down inside the box, but he only booked their defender, despite him being the last man, so it’s in-consistency there already. “Inconsistency from referees is really frustrating as a manager. Deery was gutted to be knocked out of the cup, but backed his players and felt they deserved more. “We battled away with nine men, so I know that my players gave everything and I felt we deserved to be in the next round of the cup,” he added. “I feel standing after the tie that we didn’t deserve to be out of the cup. “We dominated the game without being able to play football, because lets be fair the pitch was like a ploughed field. “We competed with them physically and I strongly feel we deserve to be in the next round, but you don’t always get what you deserve in this game. “The pitch was a ploughed field and although we controlled the game for long parts and deserved to be 2-0 in front, but we knew it wasn’t over.